Stuff Points: Earn 200 points when you buy this stuff. Wash your clothes, and then spin the moisture out with the same machine. This compact washer offers incredible convenience, and outstanding value, so it's easily one of the best ways to reduce cost, while allowing you to skip expensive trips to the laundromat. It won't spin quite as fast as a dedicated spin dryer, so it's not going to pull out as much moisture in comparison, but some people prefer the small footprint, and compact convenience offered by this model. Just toss in your laundry, and then select the wash cycle you prefer. Thanks to fully automatic operation, the machine will handle the rest. It automatically cycles through wash, rinse, and spin cycles, and when connected to your faucet, it will also fill itself according to the water level you set. An agitator at the bottom rotates back and forth to ensure that every inch of material is as squeaky clean as the next, and a built in pump eliminates every drop of dirty water to keep it that way. It's large enough to handle jeans and sheets without any trouble, but it's also compact enough to store out of sight, or bring with you while traveling. You won't need anything special in your home to use it because it plugs into a regular outlet, and comes complete with adapters for your faucet. When compared to other small options, it is way more effective. When compared to larger machines, it is cheaper, faster, more gentle, and much more eco-friendly. Computer Controls. Just press a button. No complicated dials, or tedious programming. 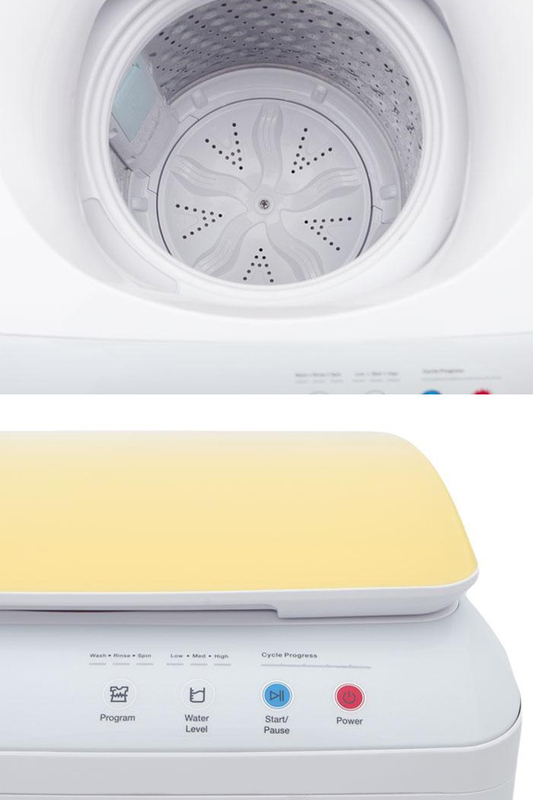 One button will turn it on, and another will select the wash cycle you prefer. Everything else is automatic. Super Compact. With a smaller footprint than similar machines, this one offers maximum washing capacity and portability combined. Perfect for small spaces, this mini washer can fit under tables, inside closets, and all sorts of other places when not in use. Built In Spinner. Other little washing machines leave clothing soaking wet. With these, hand wringing, or a spin dryer becomes necessary. This model has an integrated spinner, and an automatic spin cycle. Clothing won't be quite as dry as it would with a dedicated spin dryer, but it will be damp enough to hang dry. Environmentally Friendly. Get your laundry just as clean, but use significantly less water, electricity and soap. Your impact on Mother Nature will be less, and you'll save money without compromising cleanliness. Large Capacity. Pile in a full 5.5 pounds of laundry thanks to the ample capacity. Clean several items at once, or use for larger, more bulky items like jeans and sheets. Quick Connect. Quickly attach to your kitchen faucet for automatic filling. Included adapters will allow you to hook up to your faucet with speed an precision. Lightweight & Portable. Lift up to your counter, or store out of sight without any trouble. Thanks to the lightweight construction, you can easily maneuver this to any location that's convenient, and you can also take it with you if the need should arise. Universal Compatibility. No special connections necessary, this machine can be used in almost any location, or situation. It plugs into a regular electrical outlet, and it fills by attaching to a regular faucet. Use with or without the intake hose for maximum compatibility. Automatic Draining. Direct the long hose into your sink, or anywhere else, for effortless draining. A built in pump eliminates all water and sends it through the hose to the disposal location of your choice. Top Quality Motor. More powerful and longer lasting in comparison to others, this machine features a top quality motor. You won't have to worry about low power that does not clean, and you won't have to worry about failure due to inferior components. To prepare for washing, connect the inlet hose to your faucet, and direct the outlet hose into a suitable area for draining. Plug machine into any regular electrical outlet and press power button to turn it on. Load in your laundry. Add up to 5.5 pounds of dry clothing. Spread out evenly to maintain balance during wash cycle. Pour in detergent. 1 tablespoon or less is normally sufficient. Add more or less based on clothing type, soil level and personal preference. Use the buttons to select your wash cycle. Depending upon your selection, it will wash, and then rinse, and then spin to finish. Once water is off, disconnect inlet hose. Once clean, hang dry, or place in traditional dryer to dry in just a few minutes. 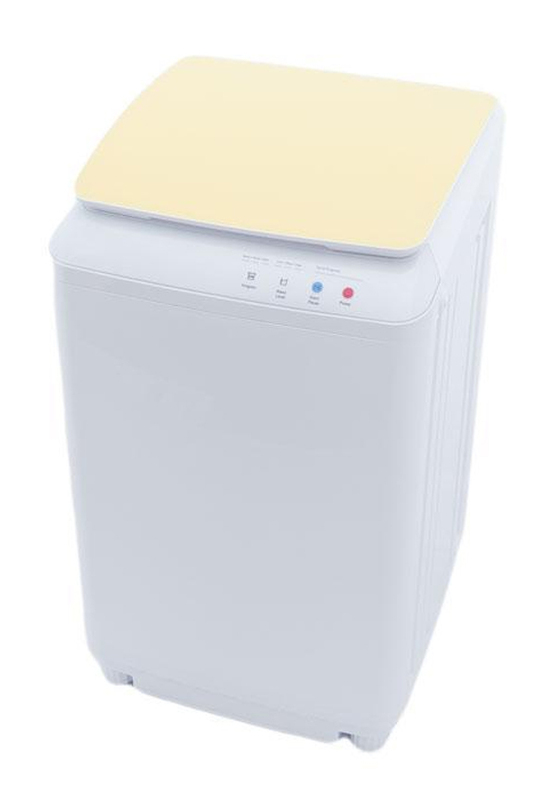 Dimensions 16" x 17" x 25"
Uses Wash small loads of laundry, no matter where you are. Fully automatic washer with spin cycle to pull water from clothing after it's clean. Perfect for dorm rooms, apartments, single people and more. 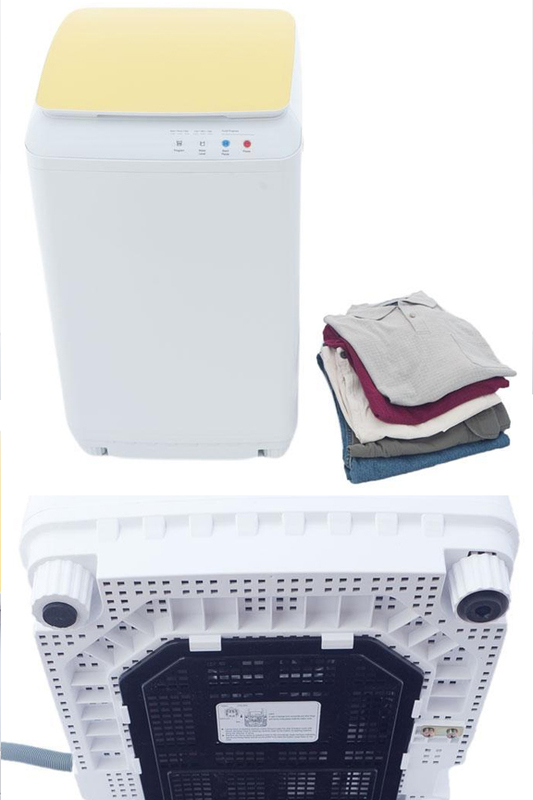 Use less electricity at home, or wash clothes while traveling without the cost or hassle. Never go to the laundromat again! Wash clothes without effort, and spin out moisture to leave them mostly dry. Lightweight and portable, this machine is perfect for small spaces, or anyone that needs to clean laundry on the go. It's environmentally friendly and cost effective when compared to most other options. Order Yours Today! So far so good. It's a great machine. The connector part to my faucet was the wrong size (faucet not standard) so I went to the True Value Hardware where I got the right connector. After seting up the machine it works great. Luv it and would recommend it. It does everything they say it does. And it does spin out the cloths damp dry ready for hang up and in the sun most things are total dry in 20 minutes. nastybiker. I received this as a gift and I am so pleased. It's whisper quiet and works like a dream. Love it, I would highly recommend it! Thank you so much for you prompt service. What is the weight of this machine...is it on rollers...can it be used on counter top...does the water drain into a sink ? It weighs about 35 pounds. You can use it on the counter top and it has a long drain hose so you can direct the water anywhere you want as it exits the machine. 24 of 25 Customer(s) found this Answer helpful. Is this shipped in a box that hides what it is? Can you tell it's a washing machine when it arrives at my door? The default box is mostly plain, but does have manufacturer name and address on it. If you need 100% stealth packaging, we can do that for an extra charge, just give us a call. Can this be hooked up to a standard bathroom faucet ? Depending on the faucet, some modification or an adapter may be necessary. 17 of 17 Customer(s) found this Answer helpful. Are replacement parts available through your company or through a third party (Home Depot, Lowes, etc.)? We should be able to get you any replacement part you need, just give us a call. 16 of 18 Customer(s) found this Answer helpful. 16" x 17" x 25"
14 of 15 Customer(s) found this Answer helpful. who delivers the appliances ? Currently, most of these machines are delivered by FedEx. 13 of 13 Customer(s) found this Answer helpful. Does this machine have a stainless steel drum? Yes it does. The inner drum is stainless steel. Can only one be ordered or is 2 the minimum? You can order any qty. You just pay a lower price if you get more than one at a time. 9 of 9 Customer(s) found this Answer helpful. Would you recommend this device for items that state hand wash only then flat dry? I'm looking for a small counter top item that is gentle with my clothes with washing and spin drying. I have a regular washer and dryer. It's a pain hand washing then trying to squeeze water out with items wrapped in a towel. Absolutely! It's perfect for hand-washables and delicates. Save yourself time and effort by using this machine instead, and never worry about unnecessary wear or damage. Is this large enough for a queen or king size comforter? No. It's probably not big enough for most king and queen comforters. Yes. It's ideal for delicate fabrics. This product is also sold on ... and has a warranty from the company itself, yet I don't see it mentioned here. Is there a warranty if I purchase from Simplygoodstuff? I had never heard of your site and you have a lot of great deals, and free shipping is unheard of, that's amazing! I would love to do this and share your site with my friends & family. We live in a rural area so online shopping is our only option. Thanks in advance for your help! Yes. We are an authorized dealer for this machine, and when you get it from us, it comes complete with a two year manufacturer's warranty. Do you ship to Singapore? If yes, how much is the shipping fees? Thanks. We do. For exact cost, enter your delivery information at checkout and rates will display. Do you ship to moose jaw sk? Is this washer gentle enough for hand washables? This machine measures 25 inches tall. It's big enough to handle sheets and some blankets, but most comforters are going to be too bulky to fit comfortably inside. Yes. We do ship to your location. An electrical adapter may be required.